This brief review focuses on Toyota engines produced since 1990s to 2010s. The data is based on experience, statistics, reviews of the owners and repairers. Issue 5th, updated. Despite the criticality opinions, it should be remembered - even relatively unsuccessful Toyota's engine is more reliable than most creations of the local russian automotive industry. - 1st wave (1970s - early 1980s) - forgotten old series (R, V, M, T, Y, K, early A and S). - 2nd wave (mid-1980s - early 2000s) - best Toyota's classic (later A and S, G, JZ). - 3rd wave (since late 1990s) - "revolutionary" series (ZZ, AZ, NZ). Special features - alloy cylinder blocks, variable valve timing, chain timing drive, ETCS. - 4th wave (since the mid-2000s) - the "evolutionary" development (ZR, GR, AR). Special features - DVVT, versions with Valvematic, hydraulic lash adjusters. Since the mid-2010s - re-introduction of direct injection (D-4) and turbochargers. A series engines shared first place with S series in reliability and popularity. It is difficult to find a better-designed engines, with so good maintainability and without any spare parts supply problems. Installed in C- and D-class cars (Corolla / Sprinter 90-110, Corona / Carina / Caldina 170-210 families). 4A-FE (1988-2001) - the most known engine of the series, mass, deservedly beloved, without significant structural defects, easy to maintenance; small drawbacks - a tendency to increased wear of camshaft beds, non-floating piston pins. 5A-FE (1988-2005) - the basic motor, produced not only in Japan, but at Chinese factories for Southeast Asian market and joint models. 7A-FE (1994-2002) - later modification with increased displacement. The optimal versions of 4A-FE and 7A-FE were used for Corolla family. However, being installed in Corona / Carina / Caldina, they got the "LeanBurn" system, designed for lean combustion and helps to save fuel at traffic jams (more about feature - "Toyota 4A-FE Lean Burn", at which models installed - "Lean Burn on Toyota A engine series"). But the Japanese harmed consumers - many owners of these engines were faced with the so-called "LB problem", which reveals as specific power loss at medium rpm, the cause of which and cure were unknown thoroughly - whether the poor quality of gasoline, whether problems in fuel system or ignition (these engines are highly sensitive to spark plugs and high-tension leads condition), or all together - but sometimes lean mixture just not fired. "7A-FE LeanBurn - low-speed torque, it is even stronger than 3S-FE because of maximum torque at 2800 rpm"
Especial high-torque at low rpm of 7A-FE LeanBurn - one of the common misconceptions. All -FE engines of A series have "two-humped" torque curve - with the first peak at 2500-3000 and the second at 4500-4800 rpm. The height of these peaks is almost the same (difference below 5 Nm), but STD engine have second peak slightly higher, while LB - first peak. But absolute torque maximum of STD is more (157 vs. 155 Nm). Compare with 3S-FE - maximum torque of 7A-FE LB and 3S-FE type'96 is 155/2800 and 186/4400 Nm respectively, 3S-FE at 2800 rpm have torque 168-170 Nm and 155 Nm - already at 1700-1900 rpm. 4A-GE 20V (1991-2002) - forced motor for small "sport" cars replaced in 1991 the previous basic engine (4A-GE 16V). To provide 160 hp output, the Japanese used the cylinder head with 5 valves per cylinder, the VVT system (the first application of variable valve timing by Toyota), and redline at 8.000 rpm. Minus - such engine had inevitably heavier wear in comparison with the average 4A-FE of the same year, because initially bought not for gentle riding. ** Hereinafter given specs for later engine modifications. Small-displacement engine series in 1980-90s. Installed in B-, C-, D-class cars (Starlet, Tercel, Corolla, Caldina). 4E-FE, 5E-FE (1989-2002) - basic engines. 5E-FHE (1991-1999) - more powerful version with higher redline and variable intake geometry. 4E-FTE (1989-1999) - turbocharged version that turned Starlet GT in "rabid stool" (local term for small powerful cars). On the one hand, the series have not many critical defects, but on the other hand - rather worse than A series: very weak crankshaft seals, excessive cylinder-piston wear (moreover re-boring was not permitted by manufacturer). And remember that the engine power must conform to the vehicle class - so 4E-FE is appropriate for Tercel but weak for Corolla, and 5E-FE - weak for Caldina. Operating with high load, they have a shorter lifetime and a higher wear against normal engines at the same models. * Under normal conditions, the valves and pistons collision does not occur, but under adverse conditions contact is possible. Note, two actually different engines with the same name existed. First generation - optimal, reliable, unpretentious - produced in 1990-98 (1G-FE type'90). Among the drawbacks - oil pump drive by timing belt (at cold start with frozen oil the belt can jump or teeth cut-off)), weak oil pressure sensor. Overall, it's a good unit, but do not expect outstanding dynamics. In 1998, the engine has been updated radically - with increasing the compression ratio and higher redline output was raised up by 20 hp. The engine was equipped with VVT system, variable intake system (ACIS), direct ignition and throttle valve electronic control (ETCS). The many changes are in the mechanical part - cylinder head construction completely changed, hydraulic belt tensioner appeared, cylinder block, pistons, crankshaft were updated. The parts for 1G-FE type'90 and type'98 are not interchangeable. The valves and piston collision now occurs if timing belt broken. Reliability and service life of the new engine definitely dropped, so legendary indestructibility, easy maintenance and simplicity were lost, and only the same name left. The absolute record for longevity among Toyota engines belongs to K series, that produced since 1966 to 2013. In the period under consideration, these motors were used at commercial versions of LiteAce / TownAce family and at special machinery (forklifts). Extremely reliable and archaic (camshaft in the block) design with a good safety factor. The general lack - poor characteristics, corresponding to the time of the first appearance of the series. 5K (1978-2013), 7K (1996-1998) - versions with carburettor. The main and practically the single problem is a too complicated fuel system, so instead of trying to repair or adjust, it is optimal to install a simplest carburetor from older local cars. 7K-E (1998-2007) - later version with fuel injection. One of the most successful mass series. Installed in D-class (Corona, Vista), E-class (Camry, Mark II), minivans and vans (Ipsum, TownAce), SUV (RAV4, Harrier). 3S-FE (1986-2003) - basic engine of the series - powerful, reliable and unpretentious. Without critical defects, but non ideal - rather noisy, coming-with-age oil consumption, overloaded timing belt (also drives water pump and oil pump), the engine tilted to bulkhead (access to intake manifold and injectors is difficult). Best modifications were produced in 1990-96, but updated version (type'96) was not so trouble-free. Serious defect - connecting rod bolts breaking - see "Toyota 3S engines and broken connecting rod". Repeat once again - never reuse connecting rod bolts of S series engines. 4S-FE (1990-2001) - smaller version, completely similar to 3S-FE. 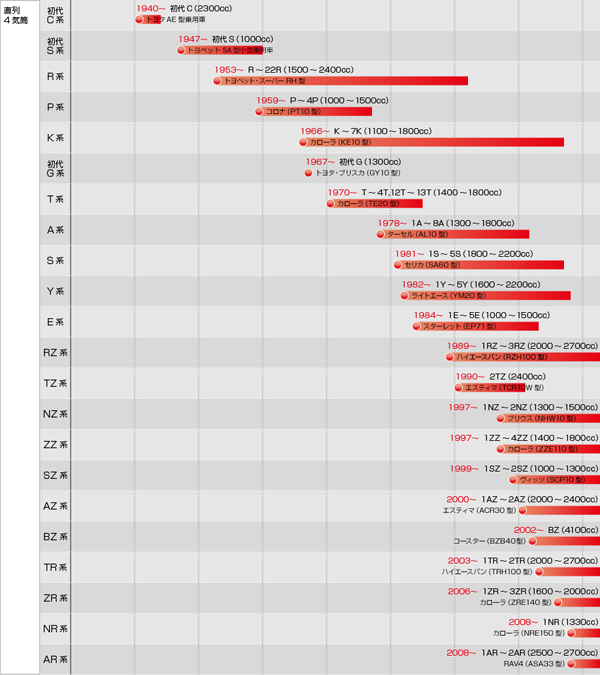 Its performance is enough for most models, but not for Mark II family. 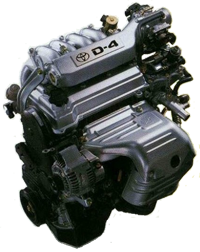 3S-GE (1984-2005) - forced engine with "Yamaha cylinder head", available in a variety of versions with different designs for sporty D-class models. It was one of the first Toyota's engine with VVT, and the first with DVVT (Dual VVT). 3S-GTE (1986-2007) - turbocharged version. Some notes for turbo boosted engines: high service cost (the best oil with minimal replacement intervals, best fuel), additional complexity of maintenance and repair, relatively small lifetime. Ceteris paribus remember: even first Japanese buyers took turbo not for shop-riding, so residual durability of the engine and the whole car is unknown, and it more than critical for cars used at russia. 3S-FSE (1996-2001) - version with direct injection (D-4). The worst Toyota's gasoline engine ever. Irrepressible thirst for perfection transformed good engine into a nightmare. Just never buy cars with this engine. The first problem - the deterioration of the high pressure fuel pump, after which a considerable amount of gasoline gets into the crankcase, cause a catastrophic aftermath to crankshaft and the other elements with sleeve bearings. There are a large carbon deposits in the intake manifold due to the EGR system operation, that affects the engine startability. Above-mentioned "fist of friendship" - standard end of a career for most 3S-FSE (this problem officially recognized by Toyota as safety affecting failure... in April 2012). There are enough problems at other systems of the engine, that have nothing in common with normal S series motors. 5S-FE (1992-2001) - version with increased displacement. As for most gasoline engines larger than 2.0, the Japanese applied the balancer mechanism with gear drive, which slightly affects the overall reliability. Replacement of old F series, durable classic large-displacement engine. At 1992-2009 installed in heavy SUVs (Land Cruiser 80..100), the carburettor version continues to be used for special machinery. A serious company should have its own V12 - Toyota used it since 1997 to 2017 for executive Century. Features - alloy cylinder block wtih liners, VVT system, duplicated for each bank the fuel and ignition systems. Mass top engine series, different versions installed in all FR models (Mark II, Crown families, sport-coupes). These engines are the most reliable among the powerful and the most powerful among available to the mass consumer. 1JZ-GE (1990-2007) - the basic engine for the domestic market. 2JZ-GE (1991-2005) - "worldwide" version. 1JZ-GTE (1990-2006) - the turbocharged version for domestic market. 2JZ-GTE (1991-2005) - "worldwide" turbocharged version. 1JZ-FSE, 2JZ-FSE (2001-2007) - not the best versions with direct injection (D-4). There were no significant defects, the engines are very reliable with proper care (sensitive to wet, so engine washing is not recommended). 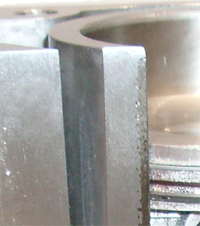 They are considered as ideal workpieces for various tuning. After modernization in 1995-96 the engines were equipped with VVT and distributorless ignition. It would seem that this is one of rare occasions when motor update did not affect reliability - however, we not only hear but see the problems with piston sticking in cylinders (cause subsequent destruction and the connecting rods bending). "Transitional" (from 2nd to 3rd wave) series for FF cars - E-class (Camry family), SUVs and vans (Harrier / RX300, Kluger / Highlander, Estima / Alphard). 1MZ-FE (1993-2008) - - improved replacement for VZ series. Light-alloy cylinder block with liners can not be easy re-bored, tendency to oil sludge and carbon deposits due to rather high-heat is well-known. Later version was equipped with variable valve timing. 2MZ-FE (1996-2001) - the simplified version for domestic market. 3MZ-FE (2003-2012) - larger version for US market and hybrid systems. Equipped with VVT. Entry-level engines for medium SUVs and vans (HiLux/4Runner, LC Prado, HiAce). 3RZ-FE (1995-2003) - the biggest inline-four of Toyota - rather reliable and simple, except too complicated timing drive and balancer shafts drive. The engine was often installed in models of russian automotive plants (GAZ, UAZ). As for the consumer properties, insufficient thrust-to-weight ratio for heavy models is notable, and its low fuel economy. Horizontal alignment engine for underfloor installation (Estima / Previa 10..20). Such construction caused necessity of complicated auxiliary drive (by mechanical driveline) and lubrication system ("dry sump"). And also caused a lot of trouble with any service and repair operations, a tendency to overheat, sensitivity to oil condition. Like everything associated with the first generation of Estima - it is an example of creating the problem from scratch. 2TZ-FE (1990-1999) - the basic engine. 2TZ-FZE (1994-1999) - version with supercharger. For about twenty years - Toyota's hi-end series, designed for large FR cars (Crown, Celsior) and heavy SUVs (LC 100..200, Tundra / Sequoia). A very successful engines with a good safety margin. 1UZ-FE (1989-2004) - the basic engine, for passenger cars. In 1997 was equipped with variable valve timing and direct ignition. 2UZ-FE (1998-2012) - version for heavy SUVs. In 2004 was equipped with variable valve timing. 3UZ-FE (2001-2010) - replacement of 1UZ for passenger cars. Generally unsuccessful series, rapidly disappeared from the market. Installed in FF E-class (Camry family) and medium FR SUVs (HiLux, LC Prado). Versions for FF cars were unreliable and capricious: high fuel consumption, high oil consumption, a tendency to overheat (which usually leads to warping and cracking of cylinder heads), fast wear of the crankshaft main journals, too sophisticated hydraulic fan drive. Also a relative rarity and high cost of spare parts. 5VZ-FE (1995-2004) - installed to HiLux Surf 180-210, LC Prado 90-120, large vans of HiAce SBV family. This engine was quite unpretentious, without many problems of their smaller brothers. The representative of the 3rd wave - "disposable" motors with light-alloy blocks, replacement for S series. Installed since 2000 in C-, D-, E-class (Corolla, Premio, Camry families), vans (Ipsum, Noah , Estima), SUVs (RAV4, Harrier, Highlander). Details of the design and problems - in the large review "Toyota AZ series engines". The most serious and mass defect - spontaneous destruction of the thread inside holes for cylinder head mounting bolts, causing a loss of tightness, gasket damage and all usual consequences. Note. Recall campaign related to oil consumption for 2005-14 cars was declared. Replacement of E and A series, installed since 1997 in B-, C-, D-class cars (Vitz, Corolla, Premio families, Prius). Details of the design and modifications - in the large review "Toyota NZ series engines". Despite NZ structurally are similar to ZZ, forced and installed even in D-class models, nevertheless it is the most trouble-free of 3rd wave engines. This series owes its origin to Daihatsu and is some "cross" of 2nd and 3rd wave engines. Installed since 1999 in B-class cars (Vitz family and Daihatsu models). The revolutionary series came to replace the good old series A. Installed in C- and D-class cars (Corolla, Premio families), SUV (RAV4) and minivans. Typical "disposable" (alloy cylinder block with liners) engine with a variable valve timing. The main mass problem - increased oil consumption caused by constructive defects. Details of the design and problems - see the large review "Toyota ZZ series engines. No room for error". 1ZZ-FE (1998-2007) - basic and most common worldwide engine of series. 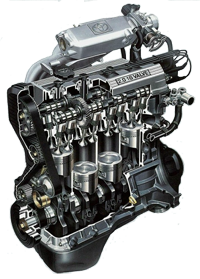 2ZZ-GE (1999-2006) - high-forced engine with VVTL (VVT system and valve lift change) and linerless block, which has little in common with the 1ZZ. Unfortunately, this is the most "gentle" and a short-lived forced Toyota's engine. 3ZZ-FE, 4ZZ-FE (1999-2009) - versions for European market. Particular drawback - the lack of Japanese domestic counterpart does not allow the to buy the cheap used engine instead broken one. Mid-size series with DVVT, supplement and substitution for AZ series. Installed since 2008 in E-class cars (Camry, Crown families), SUV and vans (RAV4, Highlander, RX, Sienna). The basic engines (1AR-FE and 2AR-FE) can be considered quite successful. Details of the design and modifications - in the review "Toyota AR series engines". Universal replacement of MZ, VZ, JZ series, which appeared in 2003 - open top alloy block, timing chain, VVT or DVVT, D-4 versions. Installed in many models of different classes - Corolla (Blade), Camry, FR cars (Mark X, Crown, IS, GS, LS), top crossovers (RAV4, RX), mid- and heavy-SUVs (LC Prado 120..150, LC 200). Details of the design and problems - in the large review "Toyota GR series engines". Three-cylinder engine instead of smaller SZ (2003-), with alloy cylinder block and a conventional roller chain. Details of the design and modifications - in the review "Toyota NR series engines". Modified version of RZ with new cylinder head, VVT system and hydraulic lash adjusters. Installed since 2003 in SUVs (HiLux, LC Prado), vans (HiAce), commercial FR (Crown 10). Note. For vehicles with 2TR-FE produced in 2013 a global recall campaign is active (valve springs failure). Replacement of UZ (2006-) - engines for top FR (Crown, GS, LS) and heavy SUVs (LC 200, Sequoia), made in the modern tradition with aluminium block, DVVT and with D-4 versions. 1UR-FE - with multipoint injection, for cars and SUVs. 2UR-GSE - forced version "with Yamaha cylinder heads", titanium intake valves, D-4S and VVT-iE - for -F models of Lexus. 2UR-FSE - for hybrid systems of the top Lexus - with D-4S and VVT-iE. 3UR-FE - the largest gasoline engine of Toyota for heavy SUVs, with multipoint injection. 4th wave engines - replacement of ZZ and small AZ. Features - DVVT, Valvematic versions (-FAE - continuously variable valve lift system - details at "Valvematic system"), hydraulic lash adjusters, crankshaft desaxage.. "Valvematic system"), lash adjusters, crankshaft offset. Installed in B-, C- and D-class cars (Corolla, Premio familes), minivans and crossovers (Noah, Isis, RAV4). Details of the design - "Toyota ZR series engines" and "Valvematic system". Typical defects: increased oil consumption, carbon deposits in the combustion chambers, knock in VVT during starting, water pump leakage, oil leakage from chain cover, alternator pulley break. For Valvematic versions - vacuum pump knocking noise, controller failures, detaching controller from the VM control shaft with subsequent engine stall. A25A (2016-) - the first-born of the "5th wave" motors ("Dynamic Force"). Installed since 2017 in E-class cars (Camry, Avalon). Although it is a product of evolutionary development and almost all solutions have been proved in previous generation, in total the new engine looks like a dubious substitution for reliable AR-series engines. Features. High "geometric" compression ratio, long-stroke, Miller/Atkinson cycle, balancer. The cylinder head: laser-clad valve seats (similar to the ZZ series), straightened intake ports, hydraulic lash adjusters, DVVT (intake - electrically driven VVT-iE), integrated EGR. Fuel system - D-4S (combined injection). Cooling - electric pump (first time for Toyota), electric thermostat. Lubrication - the variable displacement oil pump. Details of the design - "Toyota Dynamic Force engines (R4)". M20A (2018-) - the third engine of the family, mostly similar to A25A. Replenishment in a row of new turbo-motors and the first Toyota's turbo-V6. Installed since 2017 in E+ class cars (Lexus LS). Features - long-stroke, DVVT (intake - electrically driven VVT-iE), laser-clad valve seats, twin-turbo (two parallel chargers integrated into the exhaust manifolds, electronically controlled WGT) and two water-air intercoolers, combined injection D-4ST, electric thermostat. A few thoughts about the choice engine type - "Gasoline or diesel?" Classic swirl-chamber diesel, with a cast iron cylinder block, two valves per cylinder (SOHC) and timing belt. Installed in 1981-2004 in FF C- and D-class cars (Corolla, Corona families) and FR vans (TownAce, Estima 10). Naturally aspirated versions (2C, 2C-E, 3C-E) as a whole were reliable and unpretentious, but have a very modest performance, in the same time electronically controlled injection pump (-E) required rather qualified technicians for service. Turbocharged versions (2C-T, 2C-TE, 3C-T, 3C-TE) have a high tendency to overheat (following by cracks and warpage of the cylinder head) and the rapid deterioration turbocharger seals. This mainly refers to minibuses and heavy vehicles where work conditions are heavier, and the canonic example of worst diesel - Estima with 3C-T (horizontally installed motor regularly overheates, absolutely not tolerates low quality fuel, and drains out oil through seals at first possibility). Common swirl-chamber diesel series, installed in 1977-2007 in E-class cars (Mark II, Crown families), SUVs (HiLux, LC Prado), large vans (HiAce) and light commercial vehicles. Classic design - the cast-iron block, SOHC, the timing belt. As for reliability, there is complete analogy with C series: relatively successful but low-powered naturally aspirated versions (2L, 3L, 5L-E) and problem turbocharged versions (2L-T, 2L-TE). At turbo versions the cylinder head can be considered as dispensable spare part, that can by damaged even by enough long highway riding. Subcompact swirl-chamber diesels installed in 1986-1999 in B-class (Starlet, Tercel). Low performance (even with turbo) and low margin of safety. Sensitive to the oil viscosity, tendance to the crankshaft damage at cold start. There is not enough technical documentation, so for example correct fuel system adjustment can not be performed, also extremely rare parts. To replace the old OHV engines of H series, a few very successful classic diesel engines appeared. Installed in heavy SUVs (LC 70-80-100), buses (Coaster) and commercial vehicles. 1HZ (1989-) - due to simple design (cast-iron, SOHC, 2 valves per cylinder, simple injection pump, swirl-chamber, naturally aspirated) and low forcing it was the most reliable Toyota's diesel ever - kind of a legend. 1HD-T (1990-2002) - received the piston-chamber and turbocharging, 1HD-FT (1995-1998) - 4 valves per cylinder (SOHC with rockers), 1HD-FTE (1998-2007) - electronically controlled fuel injection pump. Second generation turbocharged swirl-chamber diesel produced in 1993-2009. Installed in SUVs (HiLux 130-180, LC Prado 70-120) and large vans (HiAce). The design is more complex than L series - belt and gears combination for driving of camshafts, injection pump and balancer mechanism, turbocharging, soon introduced electronically controlled injection pump. However, increased displacement and a significant torque up helped to wast many disadvantages of the predecessor, despite the high cost of spare parts. But the legend of "outstanding reliability" is just a legend formed at the time when quantity of these engines was immeasurably less than quantity of familiar and problematic 2L-T. Naturally aspirated swirl-chamber diesel with an unusual for Toyota number of cylinders - is actually a cropped version of 1HZ, but due to the layout have not so perfect engine balance. Installed in 1990-2004 at SUVs (LC 70). Designation of PSA diesels installed to some "badge-engineering" and own Toyota's models since the early 2000s. 1WZ - Peugeot DW8 (SOHC 8V) - simple naturally aspirated diesel with distribution type injection pump. 2WZ-TV - Peugeot DV4 (SOHC 8V). 3WZ-TV - Peugeot DV6UC (SOHC 8V). 4WZ-FTV, 4WZ-FHV - Peugeot DW10CTED4 (DOHC 16V). Designation of engines supplied by BMW since mid-2010s (1WW - N47D16, 2WW - N47D20). The most famous defect of this series - the inherent problems with timing chain, solved by the Bavarians since 2007 yet. The main Toyota's diesel for passenger cars. Installed since 2005 in C- and D-class (Corolla, Avensis), light-SUV (RAV4) and even some FR premium (Lexus IS). The design of 3rd wave - "disposable" aluminium cylinder block with liners and "open deck", 4 valves per cylinder (DOHC with hydraulic lash adjusters), timing chain, VGT, balancing mechanism for 2.2. Fuel system - common-rail, injection pressure of 25-167 MPa (1AD-FTV), 25-180 (2AD-FTV), 35-200 MPa (2AD-FHV), forced versions have piezo injectors. Against the competitors AD performance can be called decent, but not outstanding. Severe disease - high oil consumption and the resulting problems with widespread carbon depositions (from clogging intake and EGR to piston deposits and damage to the cylinder head gasket) - the warranty provides for the replacement of pistons, rings and all crankshaft bearings. Also: coolant leakage through the cylinder head gasket, water pump leakage, DPF regenerationsystem failures, destruction of the throttle actuator, oil leakage from the sump, injector amplifier (EDU) defect and injector defects, destruction of the high pressure supply pump components. Details of the design and problems - in the large review "Toyota AD series engines". "Transition" series replaced by AD. Installed in 2000-2006 in C- and D-class cars (Corolla, Avensis families) and light-SUV (RAV4 20). Design combined the traditional and new solutions - cast iron cylinder block, timing belt, 4 valves per cylinder (DOHC), VGT. Fuel system - common-rail, injection pressure of 30-135 MPa, solenoid injectors. More about the design - see review "Toyota GD series engines". Modernization of 1KZ with new fuel system - the most common Toyota's diesel. Installed since 2000 in SUVs / pickups (Hilux, LC Prado), large vans (HiAce) and commercial vehicles. Similar to KZ - cast iron block, gear and belt timing drive, balancer mechanism (1KD), but already VGT used. Fuel system - common-rail, injection pressure of 32-160 MPa (1KD-FTV, 2KD-FTV HI), 30-135 MPa (2KD-FTV LO), solenoid injectors at early versions, piezoelectric at Euro-5. For fifteen years of production the series obsolete - modest performance, poor economy, "tractor"-like comfort level (high vibration and noise). The most serious defect - the destruction of the pistons - is officially recognized by Toyota. The first 3rd wave diesel of Toyota. Installed since 2000 in B- and C-class cars (Yaris, Corolla, Probox families, Mini One). The design - aluminiuum "open deck" block, 2 valves per cylinder (SOHC with rockers), timing chain, VGT. Fuel system - common-rail, injection pressure of 30-160 MPa, solenoid injectors. The first V8 diesel of Toyota for flagship models. Installed since 2007 in heavy SUVs (LC70, LC200). The design - cast iron block, 4 valves per cylinder (DOHC with hydraulic lash adjusters), gear and two chains timing drive, twin VGT. Fuel system - common-rail, injection pressure of 25-175 MPa (HI) or 25-129 MPa (LO), solenoid injectors. A practice? - los ricos tambien lloran: oil burning so mass that is not considered as problem, injectors - all traditionally, but the problems with crankshaft bearings have exceeded any expectations. Some explanations to the tables, as well as notes on maintenance would make this article too bulky. Therefore, self-sufficient themes were moved to separate articles. General advices and manufacturer's recommendations - "What gasoline to use for Toyota?" General advices - "Choosing the motor oil"
General notes and the catalog of recommended spark plugs - "Toyota spark plugs"
Some advices and the catalog of recommended batteries - "Toyota. Car batteries"
A little more about the specs - "Toyota engines nominal specifications"
Reference guide with manufacturer's recommendations - "Fluids and Capacities"
The development of valve timing drives of Toyota for a few decades have passed on some kind of spiral. The archaic OHV engines mostly remained in the 1970s, but several of them have been modified and maintained in service until the mid-2000s (series K). Lower camshaft in the block was driven by short chain or gears and moved rods via hydraulic lifters. Today, OHV are using only in the segment of commercial heavy diesel engines. Since the late-1960s SOHC and DOHC engines of different series appeared - with double-row chains, hydraulic lash adjusters or adjusting the valve clearances by washers between the camshaft and the lifters (rare - by screws). The first series with timing belt (A) started in the late 1970s, but by the mid-1980s such engines - what we call "classics" - became the absolute mainstream. Initially SOHC, then DOHC with the letter G in the index - "wide Twincam" where both camshafts driven by belt, then the mass DOHC with the letter F where the belt drives one of camshaft engaged with each other by gear drive. The clearance in DOHC was adjusted by washer over the lifter, but some engines with Yamaha heads maintained washer under the lifter. If the belt is broken, the valves and pistons does not collide, with the exception of forced 4A-GE, 3S-GE, D-4, some V6 and, of course, diesel engines. The consequences for diesels are particularly hard - valve bends, valve guides are broken, often camshaft broken. For gasoline engines also important "chance" - in some engine without initially constructive interference the piston and valves covered with a thick layer of carbon deposits may collide, and contrary, the valves can luckily hang in a neutral position at engine with initial interference. In the early 1990s Toyota's variable valve timing system appeared and since it gone through several stages of development - for more details see large review "Toyota Variable Valve Timing. Evolution"
In the late-1990s new engine generation appeared, equipped with chain drive and standard mono-VVT (variable valve timing at intake). 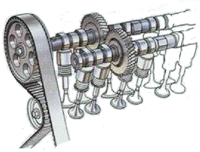 Typically, the chain drives both camshafts at inline engines, and at V-engines camshafts were engaged by gear drive or additional short chain. Unlike the older engines, new long roller chains were not so durable. Valve clearance adjusted by tappets of varying heights, that made the procedure too hard, time-stretched, too expensive, and therefore unpopular - the owners stopped to check clearance on the whole. For engines with chain drive the cases of failure are not considered, but in practice when the chain jumped or wrong installed, the valves and pistons usually collide. A peculiar derivation among this generation - forced 2ZZ-GE with variable valve lift height (VVTL-i), but this conception was not developed later. In the mid-2000s, the next generation engines production started. Its main features - Dual-VVT (variable valve timing at intake and exhaust) and revived hydraulic lash adjusters. Another experiment - the second version variable valve lifting - Valvematic at ZR series. The chain drive advantages: strength and durability - a chain, so to speak, does not break and requires less frequent replacements. The second plus - layout - is only important for the manufacturer: driving of four valves per cylinder, two camshafts with variable valve mechanism, fuel pump, oil pump - require rather wide belt. While installing a thin single-row chain saving a few centimeters of engine length, and at the same time - reduce the transverse dimension and the distance between the camshafts due to traditionally smaller diameter of sprockets in comparison of belt pulleys. Another little plus - the less radial load on the shaft due to the low pre-tensioning force. But not forget the standard drawbacks. 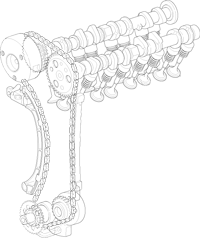 - The chain "stretch" during operation (due to wear and backlash of links joints). - To compensate the stretching the pull procedure is required (at some archaic engines) or using of automatic tensioner (which most manufacturers make). Traditional hydraulic belt tensioner works via common lubrication system, which affects its durability (so at the new engines Toyota places it outside the cover, simplifying the replacement). But sometimes the chain stretching exceeds the limit of the tensioner adjustment possibilities, so the consequences for the engine are quite sad. Some third-rate automakers install tensioners without ratchet mechanism, therefore chain chatters during each engine start. - Metallic chain inevitable "saws" slippers, its rollers and sprockets gradually wear, and wear products fall in the engine oil. Even worse that many owners does not replace sprockets and tensioners during chain replacement, although it is obvious that used sprocket quickly ruins a new chain. - Timing chain drive runs noticeably noisier than belt. Among the others, chain speed is uneven (especially if sprocket teeth quantity is small), and when the link engages the impact always occurs. - The chain cost is higher than the timing belt kit (and is simply inadequate sometimes). - Chain replacement is more labor-intensive (the old "mercedes" method is not suitable for Toyota). And the procedure requires accuracy, because valves and pistons collide at chain engines. - At some engines (Daihatsu origin) a toothed chains are used instead roller. These chains are quieter, more precise and more durable, but for unexplained reasons can sometimes jump over sprocket teeth. So, did the maintenance cost reduce after replacement the belts with the chains? The chain drive requires an interventions as often as belt drive - firstly hydraulic tensioner, then stretched chain (on average 150.000 km)... and total cost is higher, especially if do not save every cent and replace all the necessary components simultaneously. The chain is good - if two-row, if engine have 6-8 cylinders, and if there is a three-beam star on the engine cover. But belt timing drive of classic Toyota engines was so good and reliable, that long thin chains became step backwards. But not all archaic solutions are reliable, and the best example - Toyota carburetors. Fortunately, the vast majority of current toyota-drivers have started from MFI engines (which appeared in the 1970s) and skipped the Japanese carbs epoch, so they can not compare their features in practice (although in the domestic market some carburetor modifications were produced until 1998, at the overseas market - until 2004). In the post-soviet space primitive carburetor system of locally produced cars will never have competitors for maintainability and cheapness. All electronics - override-idle valve, all vacuum - ignition timing regulator and crankcase ventilation, all kinematics - throttle, manual choke and the drive of the second chamber (Solex). Relatively simple and understandable. A cheap cost allows literally carry in the trunk a full replacement kit for fuel and ignition systems, but technicians and spare parts can always be found somewhere nearby. Toyota carburetor - is another matter. Just look at 13T-U of late 1970s - a real monster with many tentacles of vacuum hoses... But later "electronic" carbs were extremely complicated - catalyst, oxygen sensor, air bypass to exhaust, exhaust gas recirculation, electrical choke, two or three stages of idle control by load, 5-6 vacuum actuators and two-stage dampers, fuel tank and the float chamber ventilation, 3-4 VSV, thermo valves, override-idle valve, ignition adjusting, air heating system, a set of sensors (coolant temperature, intake air temperature, speed, knock, throttle switch), electronic control unit... Why did they need such difficulties if normal MFI modifications already exist - who knows, but in any case such systems, tied to a vacuum, electronics and kinematics, worked at a very delicate balance. And debalanced easily - by age and dirt as any carburetor. Sometimes it was even dumber - impulsive mechanic disconnected all multiple hoses, but not remembered where to reconnect it properly. It is possible to revive this carb anyhow, but to adjust (allow at the same time to maintain a normal cold start, normal warming, normal idling, normal load adaptation, normal fuel consumption) - is extremely difficult. As might guess, a few carburettor guru with knowledge of the Japanese specifics lived at russia far-east region (former Heilongjiang and Jilin), but twenty years later even the locals forgot their names. As a result, Toyota's fuel injection was rather simpler than later carburettors - there were not much more electrics and electronics, but less vacuum and no complicated kinematics - which gave us such a valuable reliability and maintainability. "D-4 - a great engine !?" Some owners of early D-4 engines have realized that just impossible to re-sell their cars without significant losses because of disrepute - and they offensive return... Therefore, listening to their "advice" and "experience", should always remember that they financially interested in forming of positive public opinion with respect to direct injection engines. The most foolish argument - "direct injection will soon wast traditional". Even if it were true, it does not mean that direct injection engines have not alternative now. For a long time term "D-4" means a specific engine - 3S-FSE. But it was installed at 1996-2001 in three models for the domestic market, and in each case, classic 3S-FE was as alternative. Later choose between the D-4 and the normal injection usually saved... Since the second half of the 2000s Toyota refused to use the direct injection at the mass segment and returned to this theme after ten years (see also "Toyota D4 - perspectives?"). "The engine is excellent, we just have gasoline (nature, people ...) bad" - this is again scholasticism. Let this engine is good for the Japanese, but what is the use of it in Russia? - the country of poor gasoline, harsh climate and imperfect people. So instead of the mythical advantages of D-4 only its drawbacks emerge. Appeal to foreign experience "but in Japan, in Europe" is not conscientious. The Japanese are deeply concerned about the far-fetched problem of CO2, the Europeans - the reduction of emissions and fuel efficiency. In the mass, the russian people income not ever close to them, local fuel quality is worse than even US, where direct injection until 2010s was not considered - mostly due to improper fuel. Stories that "D-4 engine fuel consumption is three liters less" - just unpretentious misinformation. Even the passport maximum economy of the new 3S-FSE compared to the new 3S-FE on one model was 1.7 l / 100 km - and it's in the Japanese test cycle (so the real economy always was less). During active city driving D-4 operates at power mode, without consumption reducing. The same when highway driving - D-4 high efficiency area (speed/rpm) is narrow. And indeed, it is incorrect to talk about consumption relatively used car - it is much more dependent on the technical condition of a specific car and driving style. Experience shows that some of the 3S-FSE, conversely, consume more gasoline than 3S-FE. Often says "change the fuel pump and no problems". But regularly replacement of the main part of fuel system at relatively fresh Japanese cars (especially Toyota) - it's just nonsense. And it was not the best way to waste $300 every ~30-50.000 km. Nobody said that the fuel injectors, which are also often required replacement, cost comparable to pump. Of course, they ignored standard and fatal mechanical problems of 3S-FSE. Perhaps not everyone think about the fact that if the engine has "caught the twice oil level in the sump", it already worked with gasoline-oil emulsion instead oil that affects all the moving parts of the engine (do not juggle comparing several grams of gasoline falling in the oil during a cold start and evaporates with the heating of the engine, and constantly flow into the crankcase liters of fuel through wear D-4 pump). Nobody warned not try to "clean the throttle" - properly adjusting of the engine management system required special equipment. Not everyone knows how EGR system poisoned the engine with exhaust gas and how carbon accumulates in intake, that required regular disassembly and cleaning (approximately every 20-30.000 km). Not everyone knows that any attempt to replace the timing belt "similar to the 3S-FE" often lead to a pistons and valves collision. Not everyone knows whether there is in their city at least one garage, successfully solves the problem of D-4. And why exactly Toyota valued in russia? (While thera are cheaper, faster, sports, comfortable japanese cars? For "simplicity", in the broadest sense of the word. Simplicity in operation conditions, fuel, parts, repair... Yeah, can buy high-tech scrap for the price of a normal car. Can look for good gasoline and add some chemicals. It is possible to count every cent saved on gasoline - for upcoming repair. Can teach local technicians the basics of direct injection systems. Can re-adopt the russian "for a long time car did not break, when at last will fall?" There is only one question - "What for?" After all, consumer's choice - their private affair. The more people will contact D-4 and other dubious technologies - the more clients repair shops will have. But decency requires to say - buying old car with D-4 if any alternative exists - is contrary to common sense..
As can see, we often use "ecology" at negative context - but do not think we so love the smell of napalm in the morning exhaust gases. Just since a certain point the administrative tightening of environmental regulations has become a vicious struggle against the main purpose of the car as such, struggle costly and harmful for car owners. And no improvement in sight - environmental topics are feeding-trough for a lot of powerful parasites. Retrospective experience allows to be firmly convinced - a necessary and sufficient level of emission reduction was already provided at classic models in the Japanese market in the 1990s, or by Euro II standard in the European market. This required multipoint injection, one oxygen sensor and catalytic converter under the floor. Such cars operates for many years in the standard configuration, despite the hideous quality of gasoline, age and mileage (sometimes oxygen sensors required replacement); the catalyst could be removed without any problems - but usually there was no such need. Today, with in the normal gasoline quality and much more younger vehicles, the removal of catalysts and ECU reprogramming Euro V> II is popular massive work. If the older cars can be equipped with affordable universal catalytic, the freshest and "intelligent" cars have no other alternative than cat-manifold punching and re-programming to disable emission control. - Exhaust gas recirculation (EGR) - an absolute evil, as soon as possible it should be plugged (taking into account the specific design and the feedback control), to stop the engine poisoning and contamination of its own waste. - Fuel vapour absorbing system (EVAP) - at cars for Japanese and European markets works normally, so the problems arise only at models for US market due to complexity and "sensitivity." 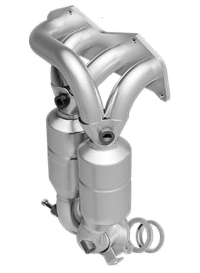 - Air injection to exhaust (SAI) - unnecessary, but relatively innocuous system for North American models. "What engine is the best?" Note - on our site the term "best" means "the most problem-free": reliable, durable and maintainable. Power output, economy - for the second time; a variety of "high tech" and "green tech" - are disadvantages. In fact, the recipe of abstract best engine is simple - gasoline, R6 or the V8, naturally aspirated, cast iron block, the maximum margin of safety, the maximum displacement, multipoint injection, the minimum forcing... alas, in Japan such engines installed only in top-class. The compromises are inevitable in affordable for the mass consumers market segments, so the motors can be not the best here, but at least "good". The next task - to assess the motors with regard to their actual use - providing a thrust-weight ratio acceptable, in which trims used (ideal for compact models engine is clearly insufficient in the middle class, a better design engine can be not aggregated with all-wheel drive, etc.). And finally, the time factor - our regrets about the excellent engines, which have been taken out of production for 15-20 years ago, do not mean that it is good idea to buy the worn-out cars with these engines today. So it makes sense to talk about the best engine in its class and its time interval. 1990s. Among the classic engine it is easier to find a few bad than to choose the best of the good. However, two absolute leader are well known - 4A-FE STD type'90 in a light class and 3S-FE type'90 in medium. In a top class 1JZ-GE and 1G-FE type'90 are equally commendable. 2000s. As for the engines of the third wave, the good words exist only for 1NZ-FE type'99 in light class; the rest of this series are competing for an outsider rank; so there are not even "good" engines in medium class. In top class note 1MZ-FE, which is against the background of the young competitors turned out not bad. 2010s. The circumstances have changed a bit - at least, 4th wave engines look better than its predecessors. In the light class 1NZ-FE still presented (unfortunately, in most cases it is "worse-upgraded" type'03). At the high segment of medium class 2AR-FE seems not bad. As for top class, due to known economic and political reasons it no longer exists for mass consumer. "Are new engines less reliable?" The question arising from the previous ones - why older series called the best? It may seems that Toyota and the Japanese in general can not to worsen anything consciously. But alas, the engineering in the hierarchy is lower than the main enemies of reliability - "ecology" and "marketing". Because of them, owners receive less reliable and durable cars at a higher price and with higher maintenance costs. Deterioration in mechanical associated with piston group. It would seem that the new pistons with cut (T-shaped) skirts to reduce friction losses could be welcome? But in practice such pistons knocking at TDC at much smaller mileage than a classic type'90. And the sound means not only noise but increased wear. The absolute stupidity is replacement of full floating piston pins by pressed in rod head. Replacing of distributor by DIS-2 may be positive - no rotating mechanical parts, longer service life of the coils, higher ignition stability... And in reality? It is clear that it is impossible to manually adjust the basic ignition timing. But new ignition coils life time drops in comparison with classical. High-voltage wires life time reduced (now every plug sparks twice for a cycle) - instead of 8-10 years to 4-6 only. Well, at least standard plugs remained simple double-electroded, not platinum. Because of the same "ecology" catalytic converter moved from the underfloor to the exhaust manifold in order to warm up faster. The result - overheating of the engine compartment, reducing cooling system efficiency. About the notorious consequences of possible contamination of cylinders with damaged converter particles - there's no need to talk. Fuel injection - sequential instead paired or synchronous (once per cycle for each cylinder). In fact, the gasoline before entering the cylinder was now given much less time for evaporation, thus automatically worsened starting at low temperatures. 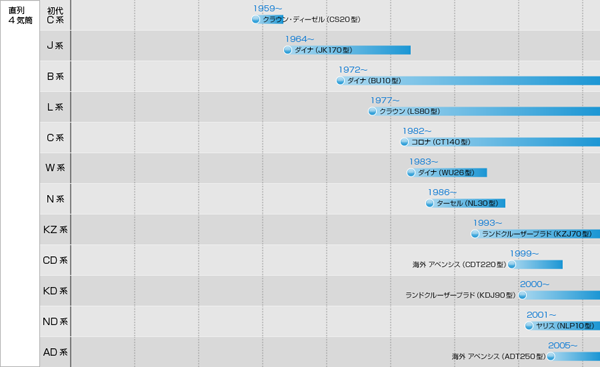 "What is life time of Toyota's engine?" In fact, the debates about the "million" mileage - it is pure and meaningless scholasticism, not applied to real cars. Can only talk about the life time before major repair, when the mass series engine, such as A or S, required the first serious overhaul (except timing belt replacement). For most classic engines it is about 200-250.000 km. As a rule, repair procedure includes replacement of the worn out or stuck piston rings and valve stem seals, but not cylinders reboring (geometry and hone on the walls usually stored). Next-generation engines usually require the attention at the second hundred km mileage, and in best case piston and rings replacing is enough (it is desirable to change the parts with modified according to the latest service bulletins). If high oil consumption and excessive noise of pistons present at mileage over 200.000 km - should be prepared for a large repair - liners wearing leaves no other options. Toyota does not provide reboring of alloy cylinder blocks, but in practice, block liners replacement and boring is possible. Unfortunately, reliable companies who perform high-quality repair of modern "disposable" motors can be really counted on the fingers of one hand. But the cheerful reports about successful liners replacement already come from village workshops and garage - what to say about the work quality and such engine durability? - understandably. "So all the new engines are bad?" But the fact - no longer an alternative exists. New engines should be seen as a reality and it is need to re-learn to work with them. Of course, car owners should avoid specific bad engines and unsuccessful series. Avoid the early version of every new engine until Toyota fix its "childhood" diseases. If there are several modifications of specific model - should always choose a more reliable - even compromising or financial, or in performance. P.S. In conclusion - must to thank Toyota for that once they produced real "peoples" engines, a simple and reliable, without many complications inherent to other brands. And let the owners of "innovative and advanced" cars call them "old-fashioned coarse" - it is a compliment! What gasoline to use for Toyota?